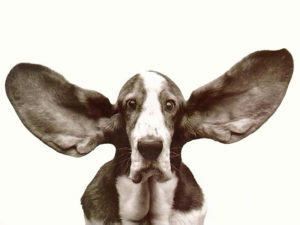 Active Listening: No more blah, blah, blah, blah…. It’s so easy to talk, to ramble on about our thoughts, our ideas, our concerns, our beliefs, our demands. We are expert ramblers, monopolizers of conversations, hijackers of others’ time. And we are often unaware of how we project ourselves. And worse, frequently indifferent to others’ views. Active listening, on the other hand, not only shows that you value the other person’s humanity. But active listening is also the key to getting the results you want. Perhaps that result is a change in someone’s perspective. Maybe you want an agreement in your favor. Or you desire a strengthened relationship. While we all know the importance of listening, it’s easy to forget that there are certain skills of listening. When implemented, they will help you create effective dialogue and an increased likelihood of achieving the outcome you seek. Here are seven of those strategies. Determining what you want ahead of time is a necessary skill of listening. Especially for conversations that are critical. Frankly, a conversation will lead you either away from or toward your goal. For example, if you decide upfront that you want an enjoyable conversation that results in a closer relationship with a colleague, then you will know to listen for opportunities to share and connect on a similar level. On a parallel note, if you are engaged in conversation with your boss, and you desire a promotion, you will listen with a critical ear in regards to whether it is the right timing, what your boss thinks of you, what he or she values in an employee, what opportunities are available, and what the vision is for the company. Thus, determining what you want will help you to ask the right questions and to listen carefully. Focus on the other person. Nobody likes talking to somebody whose eyes glaze over, lost in his own thoughts, or a person who’s fidgeting with her pen. If you want someone to truly feel heard, and consequently understood, then give that person your full attention. Don’t become distracted by what else is going on in the room or even by your own opinions. Focus. You will engage them at a higher level. Use eye contact to show you’ve connected to the person speaking. Encourage them to continue speaking by giving an occasional “uh-huh.” Smile, nod, laugh. Show that you value what they have to say, and they are more likely to listen to you. Someone once said, “If you feel like no one is listening to you, learn a new language.” Listen to what’s not being said by examining the speaker’s body language. And better yet, match theirs. We’ve all heard how body language, depending on the study, accounts for 80-90 percent of language. Think of the tremendous amount of data you can gather simply by observing gestures, facial expressions, and posture. Is he frowning, smirking, or avoiding eye contact? Is she hunched over as if exhausted and frazzled? When appropriate, match their body language. If you’re both sitting at a table and he leans forward while speaking (which generally means he’s comfortable with you), then you should lean forward as well to intensify the connection. Paraphrase what the person said. Of course you don’t want to paraphrase every response of the person speaking—that would only be annoying. However, it is very appropriate, and useful, to occasionally do so. Paraphrasing helps you to clarify what the other person said, and gives him or her the opportunity to clear up any misunderstandings. Paraphrasing also confirms that you understand, and bottom line—people want to feel understood. If you want to achieve results by listening, then ask open-ended questions. Asking open-ended questions (not simply “yes/no” questions) shows the other person that you’re interested in what he or she has to say, as well as allows you to gain additional, often vital information prior to your response. The open-ended question is one of the best tools I use with my coaching clients for drawing out the pertinent, revealing information that will help them to ultimately achieve their goals. Rarely do we enjoy silence in a conversation. We begin to feel flustered, worried that we may bore our audience. So we find ways to fill the gap in dialogue. Using silence, however, encourages the speaker to continue talking, to explore other ideas, to expand on previous ones. Basically, when you allow silence to be a tool at your disposal, you will hear more, and on a deeper level. You prove that you truly care about that person’s beliefs, values, ideas, and concerns. Remember that the key to getting results is not merely to talk, but to listen, and listen well. Active listening makes people feel valued, appreciated, respected, and liked. Mostly, they want to feel understood. You can make that happen. If they believe that you regard them in these ways, they are more apt to hear you out. And better yet, when it’s your turn, you will know what to say.